Made of polyester fiber mesh fabric, environmental friendly, strong protection against ultraviolet radiation. 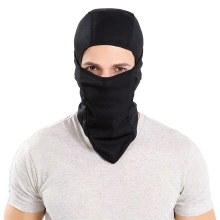 Great for an open or closed hoods, hat, scarf, half ski mask, neck gaiter or face mask. Stretchable, wind-resistant with excellent quick-drying moisture absorption lining the inner layer. Perfect for outdoor cycling, running, hiking, camping, skiing, mountain climbing and so on.